In a market as dependent on a few tech names for index gains as this one, a single stock can have an outsized effect. That's why Jim Cramer went off the charts with Bob Moreno, publisher of RightViewTrading.com and a contributor to RealMoney.com, during Tuesday's Mad Money show. Cramer and Moreno took a closer look at video streaming giant Netflix (NFLX - Get Report) to get a better sense of how its tail manages to wag the entire Nasdaq 100. Moreno is a big believer in mathematician Edward Lorenz's concept of the butterfly effect, in which small changes in a complex system can wind up having huge effects. In the case of Netflix, Cramer and Moreno started with a look at how the four FANG stocks -- Facebook (FB - Get Report) , Amazon (AMZN - Get Report) , Netflix and Google (Alphabet) (GOOGL - Get Report) -- have performed over the past year. As the chart shows, Netflix has left the others far behind with nearly double the gains of nearest rival Facebook. Once again on Tuesday, Netflix led the FANG stocks in the market's resurgence. But a shorter-term view shows that the story has changed. Over the past month, Netflix has been the worst performing FANG stock. Over the past month, Netflix is down nearly 8%, weighing on the FANG cohort. To see the outsized effects of that performance, Cramer and Moreno looked at a chart of the Nasdaq 100, the index of the hundred largest non-financial companies on the Nasdaq. Because the the Nasdaq 100 is market-cap weighted, the larger technology companies have an outsized effect on its performance. Just Facebook, Amazon, Netflix, Alphabet and Microsoft (MSFT - Get Report) account for about 40% of the Nasdaq 100's weighting. And that doesn't even include the power of Apple (AAPL - Get Report) , the largest company in the world. Moreno did a comparison of the actual Nasdaq with an equal-weighted version of the index (show in green) where every stock counts the same. 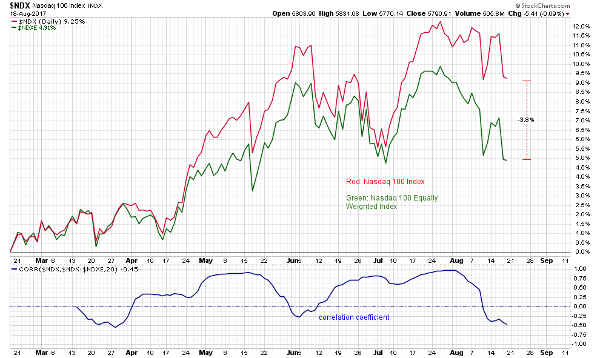 The real, market-cap weighted version of the index is nearly 4% higher than the equal-weighted version. But Moreno points out that if these stocks are important enough to give the Nasdaq a boost on the way up, they can certainly drag it lower if they keep trending down. And if a stock like Netflix keeps going lower, more and more weak-handed investors will start to sell it. Moreno's concerned that the selling won't just be limited to FANG. If the weak-handed owners give up on FANG, other investors will give up on the Nasdaq, and since tech represents roughly 20% of the S&P 500, they could end up selling that key index as well. Facebook, Amazon, Netflix and Alphabet make up more than 6% of the S&P 500 all by themselves. Throw in Apple and these five companies account for more than 10%. August is prone to short, sharp selloffs. And if Netflix flaps its wings and the whole tech cohort gets hit, followed by the whole market, Moreno is concerned that momentum players will abandon stocks. And if the selloff is sustained, Moreno fears that more value oriented investors might be reluctant to step in and do some buying. 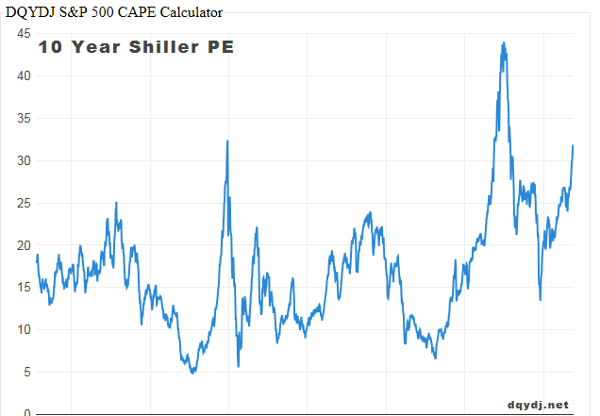 A chart of the Shiller Cyclically Adjusted Price to Earnings Ratio, a tool invented by the economist Robert Shiller, shows the market is very expensive. In fact, Moreno points out that the Shiller price-to-earnings ratio is currently sitting at 1929 levels -- where it was right before the great crash that led to the depression. That doesn't mean we're due for a crash ourselves, especially since the fundamentals of the economy are much stronger today than they were in 1929. But it does mean that it's hard to consider this market cheap. So if we do get a really brutal decline, we might need to go down a lot before this market becomes appealing to value investors. Netflix alone can't crush the whole market, but it could be the catalyst that starts a chain reaction of selling. Going back to the daily chart of Netflix itself. 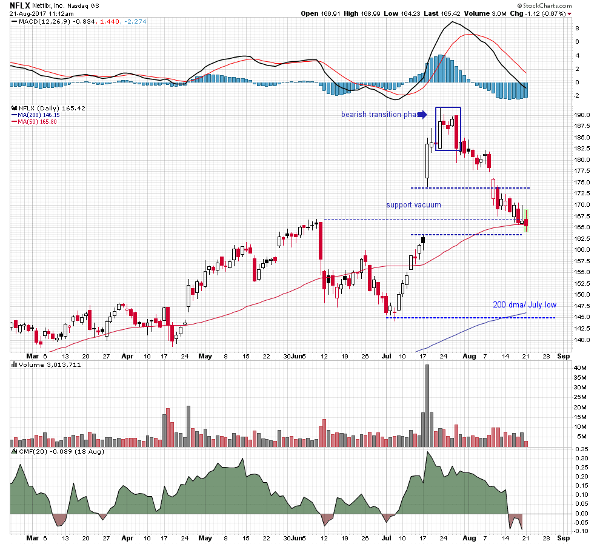 Moreno notes that, after a powerful move higher, the stock's uptrend made a bearish transition last month. There was a big one-day rally -- the large white candle -- followed by three sessions where Netflix traded sideways, followed by a large red candle, a big single-day decline that erased the earlier gains. Since then, Netflix has been getting slammed, with the stock now hanging above its floor of support in the mid $160s, along with its 50-day moving average. Moreno says that if it can keep holding above its 50-day moving average, that could postpone the weakness he's expecting. But the charts, as interpreted by Bob Moreno, suggest that this market may have gotten ahead of itself. Sooner or later, he thinks there will be a reckoning, and some butterfly -- maybe not Netflix, but some other important large-cap stock -- could be the trigger that sets off a landslide. On Real Money, Cramer says that when you look at the shale fields that BHP Billiton Ltd. (BHP bought and the prices they paid, you have to wonder whether someone just lost his mind. Get Cramer's insights with a free trial subscription to Real Money. Cramer and the AAP team point out that with stocks sharply higher, three names in their portfolio have outpaced the broader market. Get in on the conversation with a free trial subscription to Action Alerts PLUS. At the time of publication, Cramer's Action Alerts PLUS had positions in FB, GOOGL and AAPL.